Everyone knows about Belfast’s troubled past so I’ll not get into that here. This blog is about the smiley, happy moments found in the madness of everyday life so I’ll stick with that theme! I’ve lived in Belfast for just over 6 years and I am constantly being reminded what a great place it is to be. My kids attend an excellent school, I’ve met so many interesting, inspiring people since I came here and I do feel that city life agrees with me. Or maybe it’s Belfast life that agrees with me. I don’t know. I have lived in England and different towns in Northern Ireland but nowhere have I found such a fulfilling life experience. Take for example this past weekend. 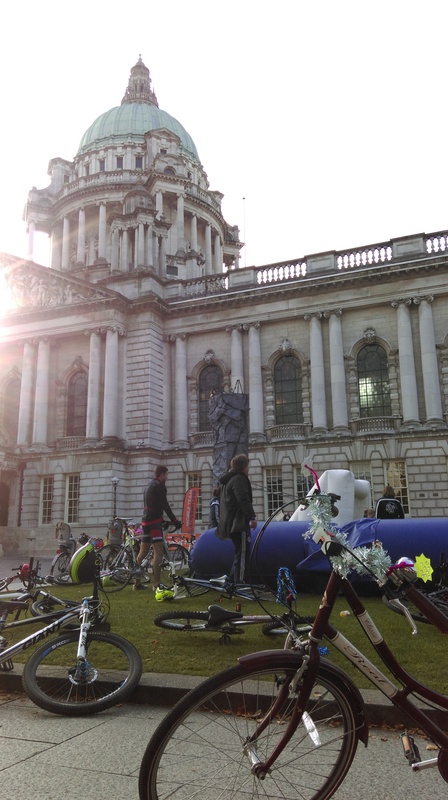 We, that is, my husband, three kids and I got out of bed at 7.30 on Sunday morning, donned our cycling helmets and headed into town on our bikes for a special cycling event – Ciclovia Belfast. We met with other cyclists at Botanic Gardens and enjoyed a morning of cycling around the city centre on traffic free roads. It was something quite special. Hundreds of people of all ages, from all walks of life and of different cycling abilities united for this event which has been months in the planning. I only heard about it a few weeks ago from a friend who loves cycling and thought it would be a fun thing to do with the kids. I am so glad we set the alarms and dragged ourselves out of bed. The sun shone and that orange Autumn glow that makes everything look like a scene from a movie made Belfast shine like I have never seen it before. It truly was something quite majestic. Have you ever taken a minute to look up at some of the buildings in the city centre? There’s some beautiful architecture to be admired. 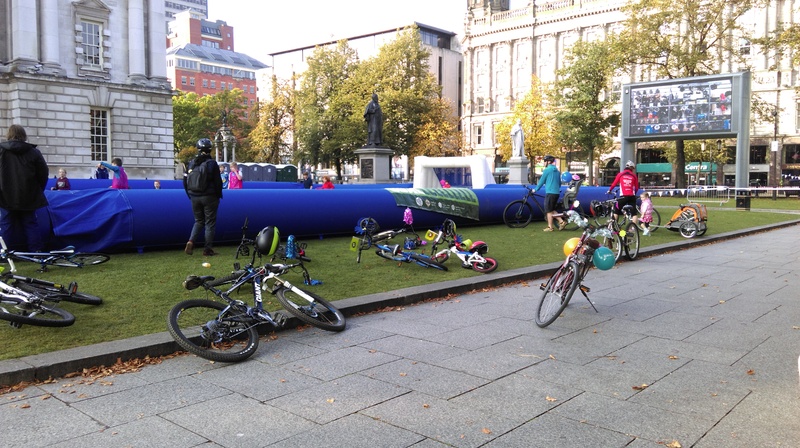 The grounds of City Hall had been transformed into a fun zone for kids, complete with football pitch, climbing wall and obstacle course – we spent hours there enjoying a coffee while the boys scored goals and braved the climbing wall, plus it was entirely free which was an added bonus. 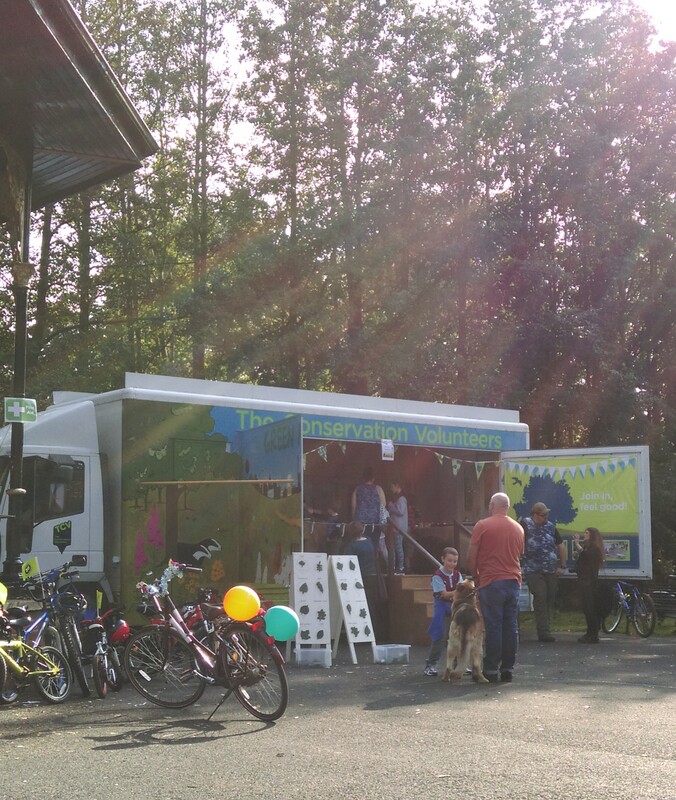 Botanic gardens was also set up with games and fun activities, musicians and circus performers lined the cycle route and Sustrans NI had set up a special stall where you could ‘bling your bike’ and learn some bike skills. My boys had an excellent time and can’t wait to go back next year. Well done Ciclovia! After the event, we took our bikes across to St. George’s market where we enjoyed some local produce for lunch and listened to the folk band that was playing. There’s always a great buzz in St. George’s and we even got asked where we had tied our bikes up as we were still carrying our cycle helmets and so the news of Ciclovia was shared via the best form of advertising in the world – person to person. I love the warmth and friendliness in this city that is alive and well. People are interested in each other and take time out from their day to be nosy and ask questions. I love that! We decided to take the Lagan towpath route home as we felt it was safer than going along the road with the children. Perhaps someday, hopefully in the not too distant future, Belfast will have a safe segregated cycle path along all of its streets. That would be money well spent. I have no doubt that more people would be out cycling with their children if it was safe to do so. Once we left the towpath we headed up through Ormeau Park so the kids could crunch leaves with their bike wheels. We were so fortunate to come across another free event being held by The Conservation Volunteers – The Big Green Weekend. 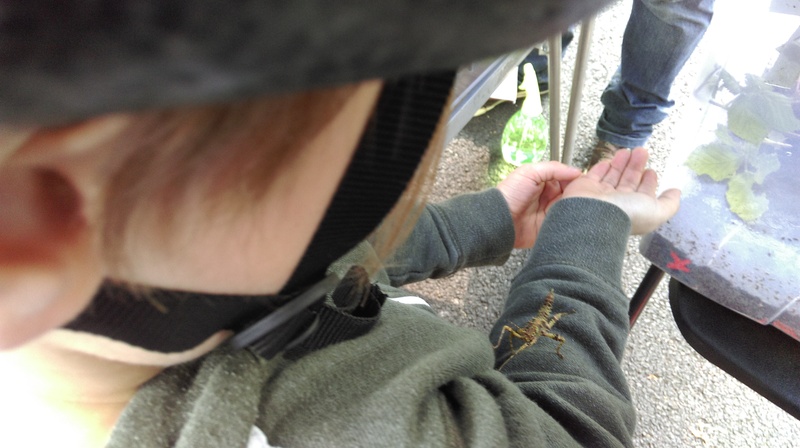 The boys took part in a drumming workshop, made bug hotels, held creepy crawlies, learned lots of cool nature facts and we enjoyed hanging out in Ormeau Park which is so pretty at this time of year. The event was so well organised, all the volunteers so friendly and willing to share their knowledge. My oldest child came back from a stand that was giving out information about food and nutrition and said that it was the most interesting thing he had ever learned about food. I have been banging on for years about the effects of sugar to little avail and yet this knowledgeable nutritionist made a huge impact on him in minutes. Thank you! I feel so fortunate to live in a city where events like this take place. There are so many people in Belfast that recognise the potential to make this city somewhere spectacular and free and exciting to live and I stand in admiration of their hard work and endeavours. I am so grateful for green spaces in a busy city where I can relax and have fun with my family. I am thankful for the local farmers, crafters and cooks that makes places like St. George’s market a great place to visit. Belfast… you really are a silver lining city.